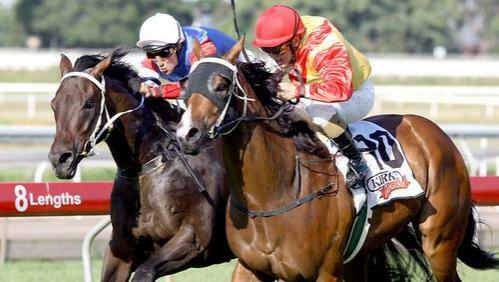 Darryl Hansen :: Essington wins Falvelon Stakes. ESSINGTON gave favourite backers a few heart flutters before finishing strongly in the Falvelon Handicap at Eagle Farm yesterday. The Darryl Hansen-trained gelding won the listed sprint by a long neck. Punters were happy to take the short odds at Essington's first open company bid and he went to the post a $1.75 favourite. Bold Glance looked to have his measure halfway up the straight but Essington stopped the clock in a blistering 1:8.8 and zipped home in a slick 33.9sec. A son of Redoute's Choice from the former good Encosta De Lago mare Besame Mucho, Essington was bought at the Easter sale in Sydney by Nick Williams for $150,000 but went winless in four starts in Victoria. Since joining Hansen's yard, he has won eight of his 10 starts. "He knuckled down today. When I saw him chasing I knew he would get him," Hansen said. "He will fight all day. The way he sprinted first up it's very hard to make a horse do that again, so the effort is huge. Both Hansen and winning jockey Chris Munce noted Essington will now be suited over more ground. "He had a lot more freshness in his legs first up, today he didn't," Munce said. "It was a tough tradesman-like effort he didn't have the dash he had first up and full credit to Darryl for having him butter up two runs in a row. "I think 1400m to a mile will be his perfect trip." Trainer Norm Hilton was anything but disappointed with Bold Glance's effort and will press ahead with plans to head south. "He will run in the Gold Coast Stakes in three weeks and will be nominated for the George Ryder," Hilton said. "I'm not sure if we will go to the Doncaster because he may not get in but he's racing well, and we may as well take him down for a shot at those better races." Essington's form had been well and truly franked in the previous race, where Cat Eyes ($5.50) won a tight photo finish over I'm Ruthless ($8.50). That pair had finished five lengths astern of Essington in his first up win.